There has been considerable debate over the merits of licensing alternative health in Canada. The arguments seem to boil down to these two points: (i) if you license a given practice then that practice receives a boost in credibility in the public’s eyes, and (ii) if you don’t license a given practice then there is a potential health risk to the public because of a lack of oversight. 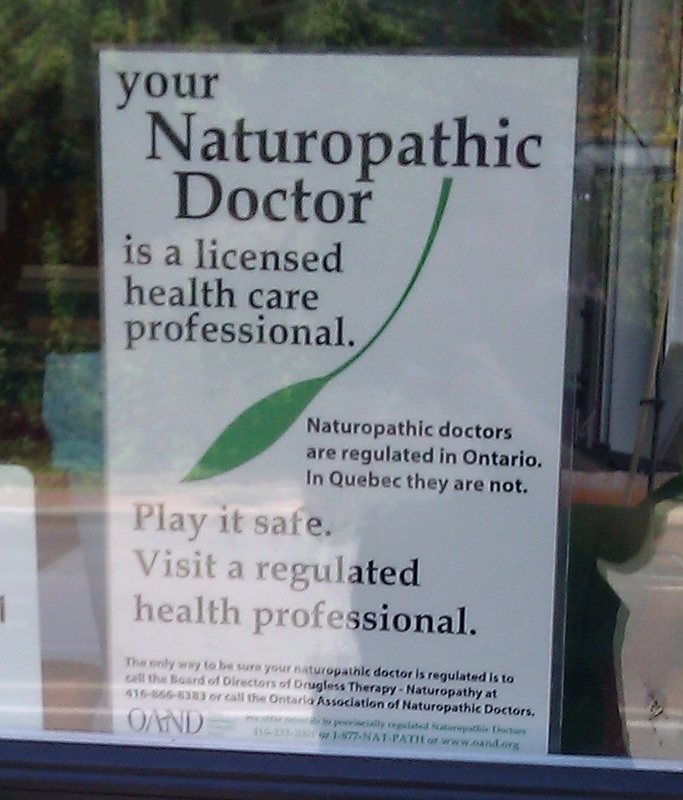 The Government of Ontario has, in the last few years, passed laws that have created the Ontario College of Naturopaths and the Ontario College of Homeopaths, which have led to signs such as the one above proclaiming “you can trust me, I’m regulated!” These two fields were regulated in the same Act as the fields of kinesiology and psychotherapy. So should we regulate these kinds of professions? It is telling, perhaps, that the Canadian Society of Homeopaths were against regulations because “…we are concerned that regulation would seriously jeopardize the long-term future of the profession and the availability of non-medically trained homeopaths across Canada”. If that isn’t an argument for regulation, I don’t know what is! It is a concern that there are homeopaths out there who are not medically trained and yet they provide front-line medical treatment for a large (and increasing) number of people. The question of whether a profession needed to prove the efficacy of its treatments or modalities before the profession could or should be regulated raised issues with respect to the regulation of complementary and alternate medicine practitioners. To HPRAC [the Health Professions Regulatory Advisory Council], the reliance of patients or clients on the therapeutic approach provided by alternate therapists was an important matter. In the practice of homeopathy, for instance, clinical trials are not used, since the profession relies on “provings” that are based on a holistic approach to health care and the “law of similars” as observed in individual patients. HPRAC has concluded that ultimately, the RHPA [Regulated Health Professions Act] does not regulate a therapy or a therapeutic approach. It does, however, regulate individuals who practice a form of health care – whether conventional, complementary or alternative – and provides a safeguard for patients or clients who choose to use complementary or alternative medicine practitioners as their first choice of care provider. However, this problem, too, may be about to end. The Canadian Medical Association Journal published an early release of an editorial (reported on here) on 14th November this year calling for an end to the “regulatory double-standard for natural health products”. The authors recognise that “…manufacturers can sell a product with implied health benefits without having to obtain the supporting scientific evidence that would be needed if it were sold as a drug” – exactly the problem that the skeptical community spends so much time fighting. It’s nice to see that the medical establishment is finally getting in on the act! I will always opt for the one with a license. It’s good for patients/customers. If practitioner is licensed he must be accountable. This always plays in favor for the patients.